From 2000 to the present, at least 28 tropical or subtropical cyclones affected the U.S. state of Louisiana. According to David Roth of the Hydrometeorological Prediction Center (HPC), a tropical cyclone makes landfall along the coastline about two times every three years, and a hurricane makes landfall once every 2.8 years. The most active month for tropical cyclone activity in the state is September, with ten total storms, while no recorded storms have affected Louisiana during the months of December through May. The most intense storm to affect the state in terms of barometric pressure is Hurricane Katrina of 2005, which also caused the most fatalities and damage with 1,833 total deaths and over $100 billion in total damages. [nb 1] Katrina is also the second costliest hurricane in the Atlantic basin. In terms of wind speed, Hurricane Katrina is also the 2nd strongest storm to affect the state,(Right behind Hurricane Rita which also hit in 2005), producing maximum sustained winds of 125 mph (201 km/h), equivalent to Category 3 on the Saffir–Simpson hurricane scale. September 9, 2000 – Tropical Depression Nine makes landfall near the Texas and Louisiana border as a tropical depression with winds of 30 mph (48 km/h). Although the depression makes landfall on Texas, most of the rain associated with the system affects Louisiana, where rainfall peaks at 6.70 in (17.0 cm). At the coast, Tropical Depression Nine brings a storm surge peaking at 3 ft (0.91 m). In Terrebonne Parish, strong thunderstorm winds associated with the depression damage trailers and boats in Bayou Black, resulting in $2,500 in damages. Early–June 2001 – Tropical Storm Allison makes landfall near Freeport, Texas on June 5, consequently stalling over the state before moving offshore and subsequently making a second landfall on Morgan City as a subtropical depression on June 11 with winds of 30 mph (48 km/h) and a minimum pressure of 1,004 mbar (29.6 inHg). This results in catastrophic flooding across the state. Rainfall from Allison peaks at 29.92 in (76.0 cm) in Thibodaux, ranking as the second–wettest tropical cyclone in state history, only behind a hurricane in 1940. Major river flooding occurs in Amite River and Comite River, which experience their highest water levels since 1983. Homes are destroyed and swept away by flooding across the state. In Zachary, a man is killed after a tornado knocks a tree onto his truck. Damages from Tropical Storm Allison in Louisiana alone total to $65 million. August 6, 2001 – Tropical Storm Barry causes tides of 2–3 ft (0.61–0.91 m) along the southeastern coast of Louisiana before it makes landfall on Santa Rosa Beach, Florida on August 6. Prior to making landfall, tropical storm watches and warnings are issued along the Gulf Coast, west to New Orleans. August 5, 2002 – Tropical Storm Bertha makes landfall on Boothville as a minimal tropical storm with wind speeds of 40 mph (64 km/h) and a minimum pressure of 1,008 mbar (29.8 inHg), moving across Louisiana as a weakening system before moving back into the Gulf of Mexico on August 7. The storm drops scattered rainfall across the state, peaking southwest of Franklinton at 10.25 in (26.0 cm). Streets were flooded by the heavy rainfall in Slidell. In St. Tammany Parish, surface runoff from flash flooding causes some rivers to exceed flood stage. Damage in Louisiana totaled to $150,000 (2002 USD, $180,000 2008 USD). September 5, 2002 – Tropical Storm Fay develops offshore the Louisiana coast before making landfall in Texas as a moderate tropical storm. West of Cameron, Fay causes a storm surge as high as 2.5 ft (0.76 m), resulting in minor beach erosion and coastal highway flooding. Tropical Storm Fay's outer rainbands drop light rainfall over eastern and southern portions of the state, peaking at 4.64 in (11.8 cm) in Grand Isle. Prior to making landfall, a tropical storm warning is issued for western parts of Louisiana east to Intracoastal City. September 14, 2002 – Tropical Storm Hanna makes landfall near the mouth of the Mississippi River as a moderate tropical storm with winds of 50 mph (80 km/h), before subsequently making landfall on the border between Alabama and Mississippi. Despite making landfall on Louisiana, as a result of convection displaced east of the center, the state receives primarily minimal effects from Hanna. No significant flooding resulted from high tides caused by the storm. Rainfall is confined to extreme eastern portions of the state, where rainfall peaks at 1.72 in (4.4 cm) in Sondeheimer, Louisiana. September 26, 2002 – Hurricane Isidore makes landfall just west of Grand Isle as a Tropical Storm with winds of 65 mph (105 km/h), having significantly weakened after stalling over the Yucatán Peninsula. Rainfall is widespread across the state, peaking at 15.97 in (406 mm) in Metarie. The heavy rains cause the failure of drainage systems, leaving numerous streets flooded. 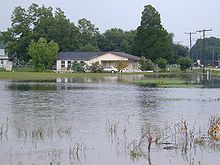 In Terrebonne Parish, 200–300 homes are flooded. The rains also damage large plots of sugar cane crop in Southwest Louisiana. October 3, 2002 – Hurricane Lili made landfall on the morning of October 3 near Intracoastal City, as a weakening category 1 hurricane. Wind gusts reaching 120 mph (190 km/h), coupled with over 6 inches (150 mm) of rainfall and a storm surge of 12 feet (3.7 m) caused over $790 million (2002 USD) in damage to Louisiana. A total of 237,000 people lost power, and oil rigs offshore were shut down for up to a week. Crops were badly affected, particularly the sugar cane, damage totaled nearly $175 million (2002 USD). No direct deaths were reported as early warnings and the compact nature of the storm circumvented major loss of life. June 30, 2003 – Tropical Storm Bill brought a moderate storm surge peaking at 5.8 ft (1.8 m) at the Louisiana Universities Marine Consortium facility in Chauvin. In Montegut, the surge breached a levee still was damaged from the effects of Hurricane Lili 9 months before. The breach flooded many homes in the town, forcing the evacuation of an entire neighborhood. As a result, 150 homes in the town were damaged, with half of them severely. 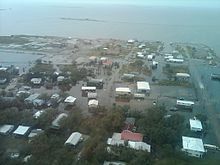 The storm surge affected numerous low-lying cities in southeastern Louisiana by flooding roadways, including the only road to Grand Isle, stranding residents and visitors. The floodwaters entered a few homes and businesses in St. Tammany Parish. Damage from the storm surge totaled to $4.1 million (2003 USD). Rough waves sank two boats offshore, though their occupants were rescued. August 31, 2003 – Tropical Storm Grace drops light rainfall across the state. 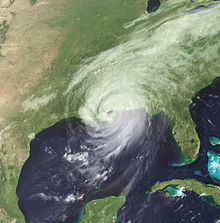 September 15–16 and September 22-23, 2004 – Around the time Hurricane Ivan's initial landfall in Alabama, the storm produced wind gusts as strong as 100 mph (160 km/h) at the Southwest Pass of the Mississippi River. In Plaquemines Parish, several school and government building as well as about 100 mobile homes. Additionally, about 50 electrical poles were toppled. About a dozen structure in St. Bernard Parish were damaged. Storm surge flooded several low-lying areas in southeastern Louisiana. About 55,000 customers lost power during the storm. Four people died during evacuation and damage in the state reached roughly $7.9 million. Upon the storm's second landfall in Holly Beach resulted in minor coastal flooding, with damage totaling only about $15,000. Inland, generally light rainfall was recorded. October 10, 2004 – Tropical Storm Matthew caused a storm surge of up to 5.85 ft (1.78 m) in Frenier. The storm surge and waves resulted in significant beach erosion in Grand Isle. Portions of Louisiana experienced significant rainfall, including a peak of 18 inches (460 mm) in Haynesville. In addition, a tornado caused damage to the roof of a trailer in Golden Meadow. Rainfall and storm surge flooded 20 homes in Terrebonne Parish. In addition, several homes in Lafouche Parish experienced flooding, including two with over two feet of water. Numerous homes in Golden Meadow experienced flooding, as well. The flooding also forced the temporary closing of numerous roads across the state, including portions of Route 11 and Interstate 10. Flood waters from the storm cracked a water line in LaPlace, leaving nearly 30,000 residents and many businesses without tap water. The problem was expected to take little time to fix, though residents were advised to boil the water before drinking it. Matthew also left 2,500 people without power for a short period of time. The storm's impact also closed several schools. In all, Matthew caused $255,000 in damage (2004 USD). July 5, 2005 – Hurricane Cindy brought wind gusts of 70 mph (110 km/h) to New Orleans, downing many trees. Rainfall also left scattered street flooding. With thousands losing electrical power, the city experienced its worst blackout since Hurricane Betsy in 1965, only to be trumped by Hurricane Katrina less than eight weeks later. July 10, 2005 – Hurricane Dennis produced light precipitation and a wind gust of 47 mph (76 km/h) at Lakefront Airport in New Orleans. August 29, 2005 – Storm surge from Hurricane Katrina resulted in multiple levee failures in the New Orleans area, flooding approximately 80% of the city, with some places being inundated by more than 15 ft (4.6 m) of water. The failures of the levees were considered the worst engineering disaster in the history of the United States. Thousands of people were stranded inside their homes or on rooftops and required rescue from boats and helicopters. Many buildings and homes were damaged, with 134,000 housing units – approximately 70% of residences in New Orleans – were impacted to some degree. 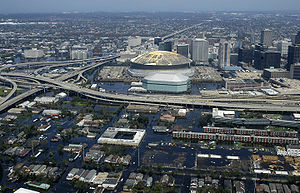 The Superdome, which was sheltering many people who had not evacuated, sustained significant damage. Two sections of the Superdome's roof were compromised and the dome's waterproof membrane had essentially been peeled off. The famous French Quarter and Garden District escaped flooding because those area are above sea level. A total of 573 deaths occurred in New Orleans alone. Several other parishes were severely impacted by the storm. Many areas outside of New Orleans also suffered wind damage, especially St. Tammany and Washington parishes. According to the United States Department of Housing and Urban Development, in St. Bernard Parish, 81% (20,229) of the housing units were damaged. In St. Tammany Parish, 70% (48,792) were damaged, and in Placquemines Parish 80% (7,212) were damaged. Nearly 900,000 Louisianians were left without electricity. Throughout the state, 1,577 fatalities were reported. Overall, it is estimated that Hurricane Katrina caused $108 billion in damage throughout the Southern United States, with much of the damage occurring in Louisiana and Mississippi. September 24, 2005 – Hurricane Rita makes Landfall as a Category 3 Hurricane On the Texas-Louisiana border. Winds were 120mph (193 km/h). Storm surge destroyed coastal communities in Cameron Parish such as Holly Beach. August 31, 2008 – Hurricane Gustav reached the Louisiana coast on the morning of September 1, making landfall near Cocodrie, Louisiana. The center of the storm continued northwest across the state, so damage and deaths were widespread in many areas; 34 parishes were declared as disaster areas. July 25–26, 2010 – The remnants of Tropical Storm Bonnie produced a localized heavy rain event on July 25, with 8 to 9 in (200 to 230 mm) of rain falling in West Baton Rouge Parish. More than 100 homes were flooded and 20 bridges and roads were washed away. Severe weather related to the system caused further damage the following day. In all, damage from Bonnie amounted to $810,000. Mid–August 2010 – Tropical Depression Five - The remnants of Tropical Depression Five make two separate landfalls within the state. Upon its classification as a Tropical Depression, the National Hurricane Center issues a tropical storm warning for much of southern Louisiana, including New Orleans. The storm ultimately dissipates prior to reaching the coastline, and the remnants of the cyclone produce riptides and strong waves along the coast. A local National Weather Service office issues flood watches for up to twelve Louisiana parishes. As the remnants of the cyclone regain strength in the Gulf of Mexico and approach the state for a second time, a coastal flood watch is issued for southern portions of the state. Up to sixteen hours of intense rain and thunderstorms flood at least 40 buildings and structures in Avoyelles Parish, Louisiana. September 4, 2011 – Tropical Storm Lee - A state of emergency is declared for New Orleans ahead of Lee, with the threat of the storm prompting the preparation of rescue boats across the city and city officials ordering the closure of floodgates. Due to its slow and erratic motion across the state, Lee drops torrential rainfall across much of southern Louisiana. Headwinds from the storm fan a large and destructive fire in Natchitoches Parish, Louisiana, where about 400 acres of land is set ablaze and subsequently destroyed. In addition, several homes in Slidell are inundated by a four-foot storm surge. New Orleans also suffers sporadic power outages, but escapes with only minor flooding. June 23–24, 2012 – Initially forecast to brush the state as a hurricane, Tropical Storm Debby prompted a state of emergency. The storm ultimately tracked far right of early predictions and struck Florida. Several days of onshore flow led to a storm surge in southeastern areas of the state, peaking at 2.68 ft (0.82 m) in Shell Beach. August 29, 2012 – Hurricane Isaac - Isaac comes ashore the state twice as a large Category 1 hurricane, producing an eleven-foot storm surge in Shell Beach. The storm produces sustained tropical storm-force winds and hurricane-force wind gusts in Grand Isle, leaving over 600,000 customers without power across the state. However, the most severe effects of the hurricane are reported in Metropolitan New Orleans, where the majority of residents are left without power. In addition, many pumping stations in Slidell were unable to keep up with rainfall rates and the city suffered flood damage as a result. October 6, 2013 – A state of emergency was declared ahead of Tropical Storm Karen; however, the storm dissipated over the northern Gulf of Mexico and had negligible effects in the state. Rainfall was predominantly less than 1 in (25 mm), with a localized peak around 3 in (76 mm). The following is a list of hurricanes that caused known deaths in the state. ^ All damage totals are in the value of the USD during the storm's year of existence. ^ a b c Roth, David M; Hydrometeorological Prediction Center. Louisiana Hurricane History (PDF). United States National Oceanic and Atmospheric Administration's National Weather Service. Retrieved December 28, 2012. ^ Beven, Jack L. (November 17, 2000). "Tropical Depression Nine". National Hurricane Center. Archived from the original on 2 December 2012. Retrieved 14 December 2012. ^ Roth, David M. "Tropical Depression #9 - September 5-10, 2000". Hydrometeorological Prediction Center. Retrieved 14 December 2012. ^ "Tropical depression forms in gulf". St. Petersburg Times. September 9, 2000. Retrieved 14 December 2012. ^ United States Department of Commerce (September 2000). Del Greco, Stephen, ed. "September 2000" (PDF). Storm Data. Asheville, North Carolina. 42 (9): 59. Retrieved 14 December 2012. ^ Stewart, Stacy R. (February 28, 2001). Tropical Storm Allison Tropical Cyclone Report (Report). National Hurricane Center. Archived from the original on 16 September 2008. Retrieved 28 December 2012. ^ Roth, David M. "Tropical Storm Allison - June 4-18, 2001". Hydrometeorological Prediction Center. Retrieved 28 December 2012. ^ a b c d Roth, David M.; Hydrometeorological Prediction Center. "Tropical Cyclone Rainfall for the Gulf Coast". United States National Oceanic and Atmospheric Administration's National Weather Service. Retrieved December 28, 2012. ^ Roth, David M.; Hydrometeorological Prediction Center's Forecast Operations Branch; National Centers for Environmental Prediction (June 20, 2011). "HPC Storm Summary #52 for T.D. Allison". Camp Springs, Maryland: United States National Oceanic and Atmospheric Administration's National Weather Service. Archived from the original on December 22, 2007. Retrieved 28 December 2012. ^ United States Department of Commerce; National Environmental Satellite, Data and Information Service; National Climatic Data Center (June 2001). Del Greco, Stephen; Hinson, Stuart; Mooring, Rhonda, eds. "June 2001" (PDF). Storm Data. Asheville, North Carolina: United States National Oceanic and Atmospheric Administration. 43 (6): 152. Retrieved 28 December 2012. ^ a b Risk Management Solutions. Tropical Storm Allison, June 2001 (PDF) (Report). National Hurricane Center. p. 1. Retrieved 28 December 2012. ^ Beven, Jack (April 22, 2002). Tropical Storm Barry Tropical Cyclone Report (Report). National Hurricane Center. Retrieved 28 December 2012. ^ Beven, Jack (November 20, 2002). Tropical Storm Bertha Tropical Cyclone Report (Report). National Hurricane Center. Retrieved 28 December 2012. ^ Roth, David M. "Tropical Storm Bertha - August 3-9, 2002". Hydrometeorological Prediction Center. Retrieved 28 December 2012. ^ "Storm Bertha dumps rain along Gulf Coast". St. Petersburg Times. New Orleans, Louisiana. Associated Press. August 6, 2002. p. 3A. Retrieved 28 December 2012. ^ United States Department of Commerce (August 2002). Angel, William, ed. "August 2002" (PDF). Storm Data. Asheville, North Carolina. 44 (8): 98. Retrieved 28 December 2012. ^ Stewart, Stacy R. (June 23, 2003). Tropical Storm Fay Tropical Cyclone Report (Report). National Hurricane Center. Retrieved 28 December 2012. ^ "Tropical Storm Fay threatens Texas, Louisiana". Cable News Network. September 6, 2002. Retrieved 28 December 2012. ^ Franklin, James L.; Rhome, Jamie R. (December 16, 2002). Tropical Storm Hanna Tropical Cyclone Report (Report). National Hurricane Center. Retrieved 28 December 2012. ^ a b United States Department of Commerce; National Environmental Satellite, Data and Information Service; National Climatic Data Center (September 2002). Angel, William; Hinson, Stuart; Mooring, Rhonda, eds. "September 2002" (PDF). Storm Data. Asheville, North Carolina: United States National Oceanic and Atmospheric Administration. 44 (9): 65. Retrieved 28 December 2012. ^ a b Avila, Lixion A. (December 20, 2002). Hurricane Isidore Tropical Cyclone Report (Report). National Hurricane Center. Retrieved 17 March 2013. ^ "Louisiana Event Report: Flash Flood". National Climatic Data Center. 2010. Archived from the original on October 21, 2010. Retrieved October 21, 2010. ^ "Louisiana Event Report: Thunderstorm Winds". National Climatic Data Center. 2010. Archived from the original on October 21, 2010. Retrieved October 21, 2010. ^ a b Todd B. Kimberlain (February 21, 2013). Tropical Storm Debby (PDF) (Report). Tropical Cyclone Report. Miami, Florida: National Hurricane Center. Retrieved November 13, 2015. ^ "Tropical Storm Debby turns sights on Florida, Alabama; Gulf oil production curtailed". NBC News. June 24, 2012. Retrieved March 30, 2013. ^ "Latest track shows weaker Karen making hard right turn". WESH TV. Orlando, Florida. October 6, 2013. Retrieved April 17, 2014. ^ Todd B. Kimberlain (January 8, 2014). Tropical Storm Karen (PDF) (Report). Tropical Cyclone Report. Miami, Florida: National Hurricane Center. Retrieved November 13, 2015. ^ David M. Roth (n.d.). "Tropical Storm Karen - October 3–15, 2013". College Park, Maryland: Weather Prediction Center. Retrieved November 13, 2015. ^ Beven II, John L.; Kimberlain, Todd B. (September 15, 2009). Hurricane Gustav (PDF). Tropical Cyclone Report (Report). National Hurricane Center. Retrieved 28 December 2012. ^ Knabb, Richard D.; Brown, Daniel P.; Rhome, Jamier R. (September 14, 2011). Hurricane Rita (PDF). Tropical Cyclone Report (Report). National Hurricane Center. Retrieved 28 December 2012. This page was last edited on 25 March 2019, at 00:17 (UTC).